I have just bought some new food colourings to play with, and have been trying to think of new ways of using them. 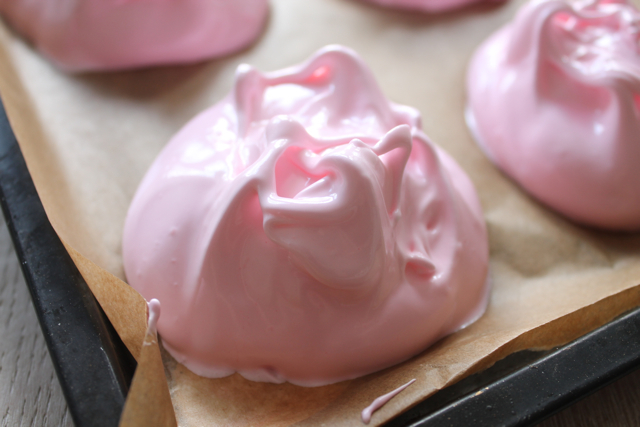 Of course, meringues are ideal because the mixture is white so the food colouring really stands out. 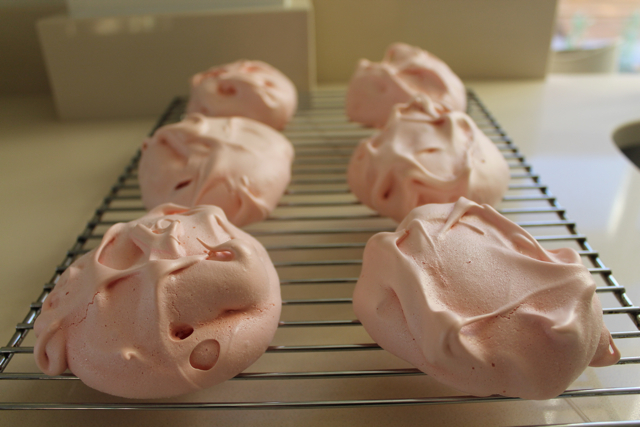 I've not made meringues before so I was interested to see if it would be something easy to do. Preheat the oven to 140c. Put your egg whites in a large grease free bowl. 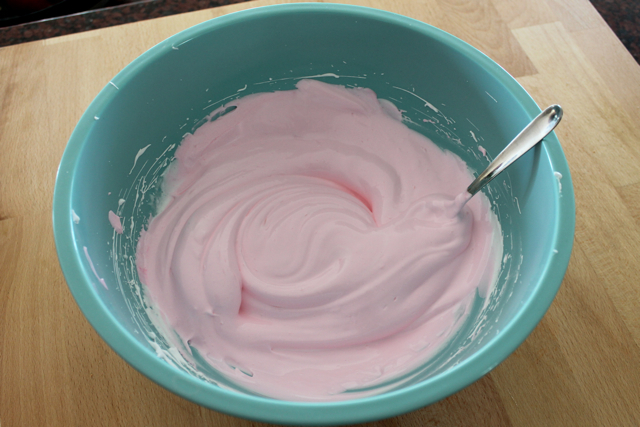 Mix with an electric whisk until they form soft peaks. (You can use a hand whisk instead if you are feeling strong and energetic.) Gradually add the caster sugar 1 table spoon at a time, still mixing with the whisk, until all the sugar is added and you have a thick glossy mix. Then add a small amount of your food colouring (it really doesn't take much) and mix until it is all blended in. If you want a darker colour just add a little more colouring until it is right. Line your baking tray with baking paper. You can use a small dollop of mixture in each corner to hold it down. Now for the fun part. Using a metal spoon place 6 craggy dollops (yes, that is the technical term, the recipe says so) onto your baking tray spread evenly apart. Pop these in the oven for 1hr 15 mins. Once done place on a wire rack to cool. Your meringues will still be mallowy in the centre. If you would like them to be crisp all the way through put them in the oven for 1hr 30 mins. Then turn the oven off and leave in to slowly cool for a further 4 hours, then transfer to a wire cooling rack. I am so happy with how these turned out. I am definitely going to make them in lots of different colours now I know the recipe works. It was super easy to do and although they took a while to cook I hardly spent any time at all actually preparing. On top of that it only takes 3 ingredients, all of which you probably already have in your kitchen cupboard! Oh, and Chris can actually eat these! (he is wheat intolerant) which is a serious bonus, it can be so tricky to find him desserts sometimes! 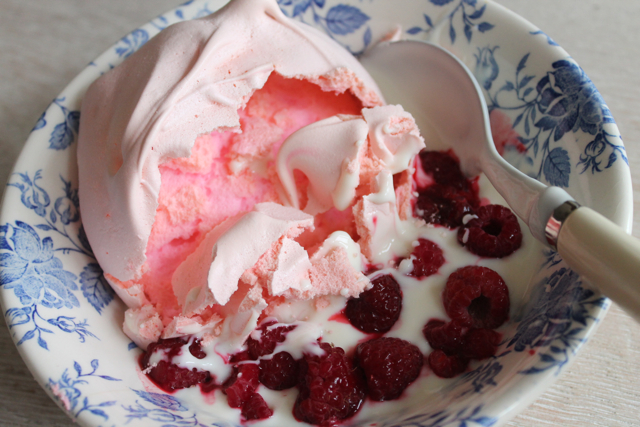 We ate ours with organic vanilla yoghurt and raspberries, yum yum! If you try this recipe i'd love to know how it turns out. I love meringues but I've never ever thought of putting food colour in them, I don't know why because it is possibly the most genius idea ever! (: So so pretty, perfect for a tea party. Thanks :) They would definitely be great for a tea party! Those look amazing! 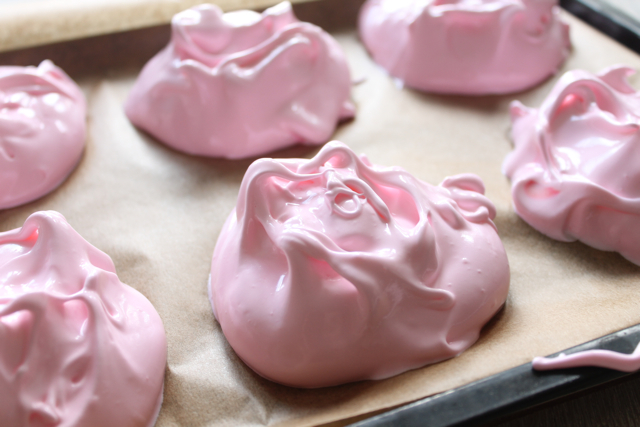 I've never made meringues, but I may have to give it a try now! Blue ones would be great! That must be such a pain for you. I'm still trying to find the perfect wheat free cake recipe - but these will do nicely in the mean time.